We got up extra early this morning to enjoy the blue sky (and wind) for a bit. Carlos came through with another amazing breakfast. After our delicious omelettes, we thought we were done, so we got up to go swing in the hammocks. 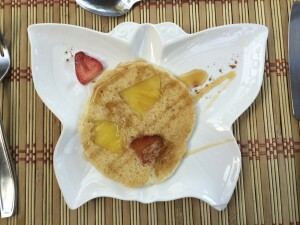 Carlos yelled “you’re not done yet!” – we forgot about the third course of breakfast, a fruity pancake. Janelle picked us up around ten to take us to Santa Maria for a coffee tour at the monte verde coffee lab. On our way, we stopped in to Dev and Harriet’s house where we toured the garden, drank some lemonade and picked some arugula for dinner that night. After a quick visit, we headed down the hill for our tour. The tour was very informal – normally it includes a hike through the plantation and then some tasting, but today the normal fellow was in San Jose so the owner met us. Instead of doing the typical tour, he really focused on the process and the different things that give give coffee character. We learned about the different ways to process the beans – from fully mechanized to more natural – and the different ways to roast. 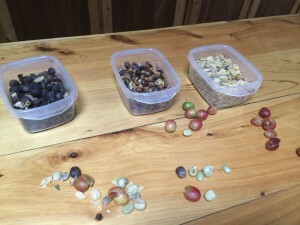 We learned about the cupping processing, and got to experience some of the steps. 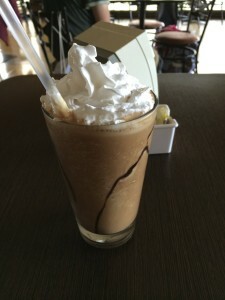 And we had some really tasty coffee. It was awesome to taste the difference between different preparation techniques (washed honey, natural) and roasts, including freshly roasted beans. We brought back plenty of coffee as well. 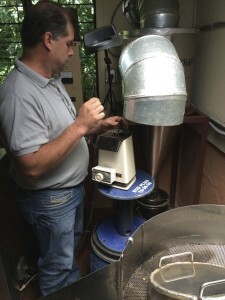 The coffee roaster had some very low-tech solutions for roasting – a hacked popcorn popper, lots of homemade parts, and a lot of intuition. Very different from the computer controlled, spreadsheet driven roasters we’ve seen here. Kat tried the beans at Each step and found they don’t really have flavor until the end. Right as the tour ended the guide Mel, that we’d run into the day before at Curi Cancha, wandered in. Small town. After the tour, we went back to Janelle’s, so we could prep for dinner. Karen arrived to give massages. I went off for a walk into town – the order of the day was the purchase of snacks. Left to my own devices, I went a bit overboard, and sampled lots of local food. And brought back plenty more for tastings. Not all of it was a win. The local donuts disappoint, but the shredded chicken wrapped in corn was awesome. Kat, meanwhile napped on the couch, took pictures of flowers and helped in the kitchen. By the time she had her massage, the sun was setting and guests had already arrived. Friday evening, lots of folks joined us for dinner. Guests included Robert Dean, the illustrator of the bird guide, Dev and Harriet, and Jim, a nature photographer and his wife Marta. The house was full and the food was good. We drank wine and threw sticks into the fire as the locals discussed the goings on around town and the local politics. Rick was certainly missed, but Monteverde is a warm and welcoming place. After video chatting with Natalia’s aunt and granny, we finally headed back to Casa Batsu.